In Round Six in National Two North, Macclesfield, Leicester Lions, Peterborough Lions and Tynedale all clinched their first wins of the 2018/19 season and they will be hoping to double their tally of victories this weekend. Macc, Leicester Lions and Peterborough Lions are the teams which currently occupy the relegation zone in National Two North while Tynedale’s triumph last Saturday lifted them up to 12th in the league standings. Tyne travel to Huddersfield in Round Seven aiming to secure back to back wins with Macclesfield visiting Preston Grasshoppers, Leicester Lions facing Otley and Peterborough Lions taking on Fylde. At the top end of the division, league leaders Hinckley have their sights set on a seventh straight victory after making a flying start to the season. The Hornets go to Chester this weekend while elsewhere in National Two North, second placed Hull Ionians take the trip to South Leicester, Sedgley Park host Sheffield Tigers and Wharfedale come up against Stourbridge. “There is undoubtedly a buzz around Leicester Road.” That is how Hinckley’s club website described their reaction after the Midlands side secured their sixth consecutive win of the season to move four points clear at the top of National Two North. George Chuter’s men beat South Leicester last time out and the league leaders will be keen to continue their unbeaten start to the campaign when they travel to Chester in Round Seven. Going into last weekend, Chester and Hinckley were the only two teams who hadn’t tasted defeat in National Two North, but the Cheshire side’s winning streak came to halt. The men from Hare Lane were defeated by Peterborough Lions away from home which would have been a frustrating result for Chester after such a strong opening to the campaign. However, they can respond in the perfect manner this Saturday by clinching their 11th successive home victory as they look to inflict a first defeat of the season on the current table toppers. Second placed Hull Ionians travel to South Leicester this weekend aiming to keep on the coattails of Hinckley. The I’s were beaten by the league leaders in Round Four, but since then, they have responded well having secured back to back wins against Wharfedale and Stourbridge. The men from Brantingham Park are four points ahead of the rest of the chasing pack as things stand, but South Leicester can halt their progress on Saturday. South began October with a defeat against top of the table Hinckley and now they take on second placed Hull Ionians. The Midlands club, who currently occupy seventh in the table, will be aiming to bounce back immediately at Welford Road, but they face a Hull side that has won six of their last seven away fixtures at this level. Round Six would have been massively frustrating for Sedgley Park. Matt Bebbington’s side entered October in good shape after three consecutive wins, but they began this month with a defeat against Leicester Lions. 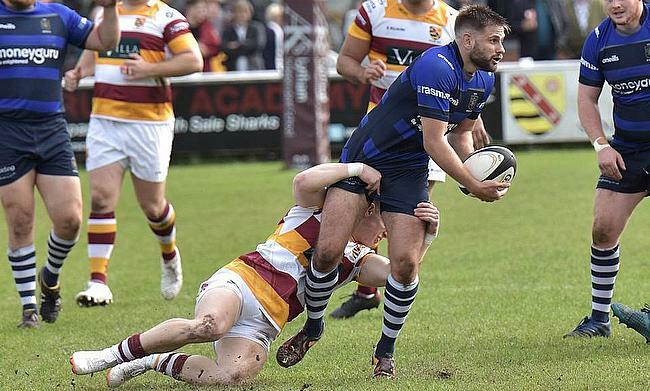 The Midlands club hadn’t picked up a single victory before last weekend so Sedge’s loss would have been tough to take, but they have the chance to hit back at home this Saturday. The Manchester-based side welcome Sheffield Tigers to Park Lane and the visitors will also be looking for a reaction. After defeating possible promotion candidates Fylde in Round Five, Jamie Broadley’s side lost to Huddersfield at Dore Moor last time out, which was their second home defeat on the spin. The Tigers were also thrashed 80-19 by Sedge in the final game of last season, but the Yorkshire club have won their last two away fixtures so they will be keen to make it a hat-trick of wins on the road. Four straight wins has been the perfect response by Huddersfield. Following two narrow defeats to begin the season, Gareth Lewis’ side have sprung into life over the last month and Field enter Round Seven currently sitting in fourth place and with a lot of confidence behind them. The men from Lockwood Park finished sixth last term and they are showing all the signs that they can improve on that league position this season, but aiming to burst their bubble this weekend will be Tynedale. The north-east club would have been delighted to get their campaign up and running in Round Six and they did so in style as they thrashed Fylde to clinch their first victory. Ben Woods’s side had a difficult September, but a win in Yorkshire this Saturday would certainly put a tough opening month to one side. The last couple of weeks have not gone to plan for Fylde. Back to back defeats against Sheffield Tigers and Tynedale have left the Lancashire club seven points off the top two going into Round Seven. Head Coach Warren Spragg told the club website Fylde “need to be much better” if they are to compete towards the promotion places and they can respond when they host newly promoted Peterborough Lions this weekend. Seriously looking forward to playing @fylderugby on Saturday, the biggest club we have ever played against, used to have their results read out on the BBC whist we were playing Perkins Engines in the battle of the Engineers! Spragg also stated the players involved in their upcoming clash with the Lions have a “big responsibility” to put things right, but the visitors will have other ideas. Peterborough Lions will arrive at Woodlands in good spirits after securing their first ever victory at this level last weekend. A valiant display saw them defeat Chester and with their maiden win now under their belt, Simon Moyle’s side will be looking to claim their opening triumph on the road. Wharfedale produced an excellent all-round performance to see off Preston Grasshoppers in Round Six. Dale had lost three consecutive games, but the Yorkshire side began October with an excellent victory and they will be keen to kick on from here, starting with the visit of Stourbridge. It has been a tough couple of weeks for Stourbridge. Back to back fixtures against the division’s top two sides was never going to be easy, but defeats in both for Stour haven’t helped them recover from a slow start to the season. Neil Mitchell’s side finished third last term, but they currently find themselves 10th in the table and 10 points off the top two. Any promotion ambitions they may have had are starting to fizzle out, but a home victory this weekend could reignite Stour’s campaign. Otley may have felt their first ever victory against Macclesfield at Priory Park was on the cards after a scintillating opening quarter last Saturday. The Yorkshire side found themselves 15-0 up, but spurned opportunities and allowed Macc back into the game. In the end, the men from Cross Green fell to their first defeat in three matches and they will be eager to hit back when they host Leicester Lions in Round Seven. Heading into last weekend, Macclesfield had not picked up a single victory and the same record applied to Leicester Lions, but both managed to claim their maiden wins of the season with the Lions performing superbly to beat third placed Sedgley Park. Andy Key’s side halted a 12-match losing streak and now they will have their sights set on achieving back to back wins for the first time in 11 months as they look to move out of the bottom three. After a series of narrow defeats, Preston Grasshoppers were second best against Wharfedale in Round Six as the newly promoted side fell to their fourth successive loss. Paul Arnold’s men have been extremely unfortunate over the last few weeks, but they will be the first to tell you that they cannot feel sorry for themselves as they aim to avoid an immediate relegation back down to North Premier. The Hoppers currently sit four points clear of danger and below them in the table are Macclesfield. The Blues visit Lightfoot Green this weekend as the bottom club in the division, but Marshall Gadd’s side picked up their first win of the season against Otley in Round Six. With a fixture against a Preston outfit who are without a win for just over a month, Macc may fancy their chances of claiming consecutive victories as they look to move away from trouble.